Wondering what you can achieve on a short course as a novice carver? Well, two students showed just how much can be done in four days at our last weekend course in August. Paul and Michael spent four days carving over the bank holiday weekend and each created really impressive three dimensional carvings. Key to their success was having a clear idea about what they wanted to make – which helped them to get off to a good start, and gave them a clear picture of what they were aiming for. Paul is a garden designer and had developed a sketch of an abstract piece that would fit well with his contemporary style designs. 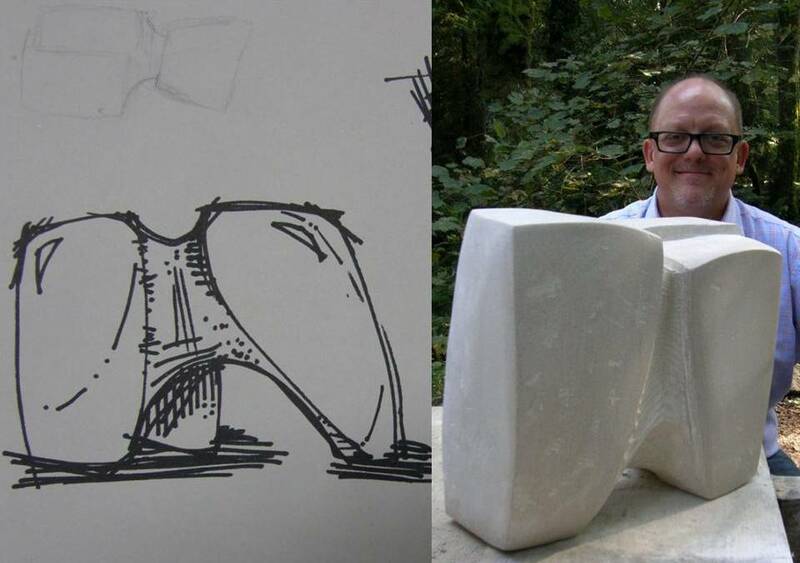 Pete set him up with a nice big piece of Portland stone and it was brilliant to see how closely the finished piece reflected the design idea. Michael’s piece also related to his profession – dentistry. He made a large molar, which is destined to grace his surgery – the tooth is in fact a wonderful sculptural form. We found it slightly disconcerting when he was working on the limestone with a chisel attached the air hammer – like a drill but on a scarily large scale! The key ingredient to finishing these two pieces within four days was undoubtedly plenty of hard work (plus flapjack and chocolate brownies), but it was great to see what beginner carvers can achieve in so short a period. Staying here in our B&B room is a good option if you want to be on the spot and dedicate plenty of time to carving. Over the same weekend we were also joined for two days by Dave and Nathan, who work as designers in London. In contrast to Paul and Michael, Nathan didn’t have a firm idea for what he wanted to make, and started on a fish design with guidance from Pete. He let the design evolve over the two days, and showed real flair for carving – the final piece is excellent with great movement and dynamism. It was interesting to see someone take a different, more ‘freehand’ and achieve such a successful carving. There are photos of Nathan’s fish and Michael’s tooth in the student’s gallery.